The first roses are blooming in my garden. I think this is the earliest I've seen since we moved here 10 years ago. I have no idea what kind of rose this is - but it has a delicate scent and blooms prolifically throughout the summer, if I continue to deadhead it. Unfortunately, black spot is rife here and my roses are infected with it already. After a week that began with rain and cold, the sun began shining midweek and the temperatures warmed up considerably. A chill wind coming off the water meant we were happy for our jackets and long pants, as Little Miss is modeling above. She would run straight into the waves and is not frightened by the ocean's vastness at all. Bubbles, rocks, seaweed and sand fascinate her. Flocks of gulls stood on the beach, all facing into the wind, their feathers ruffling. This one looked out to sea, probably thinking, "When is the wind going to stop? Mrs. Gull is expecting me home to do my chores soon." Happy Memorial Day to my American friends. I'm linking to Mosaic Monday at the Little Red House. Thank you, Mary, for hosting us once again. Pretty roses, and pretty grandbaby! Happy Memorial Day. Your Little Miss is adorable. And I just love your roses. Lovely photos, have a great week! What a beautiful rose. Here in the UK they are only just beginning to flower. Black spot. That's what you get for living on the wet coast. 8-) My roses get aphids, swarms of them. ....mirror on the wall, whose the prettiest, roses or Little Miss............this time that adorable sweetie is the winner I think! Lovely pics Lorrie. I have bad case of black spot on mine this Spring....I need to get something for that even though I don't like using chemicals. Perhaps I can find a natural remedy at the garden center. Lovely photos and sweet grand baby. Have a lovely week. 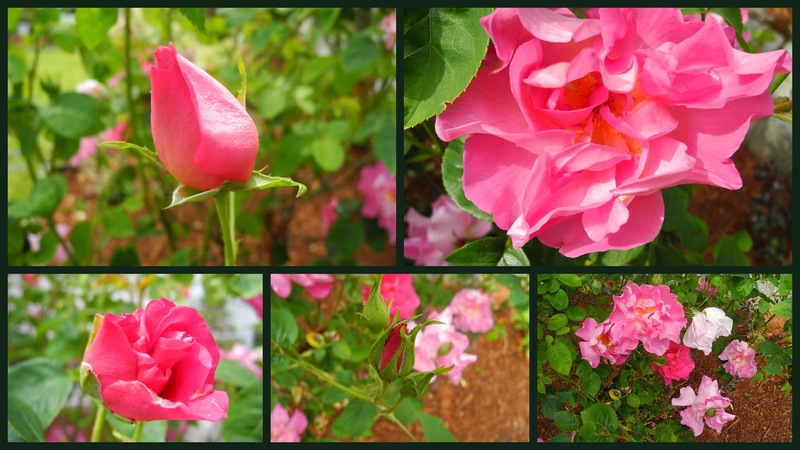 Beautiful rose, such a beautiful shade of pink. Little Miss is sooo cute in her pink boots and hat. Have a wonderful day. Beautiful roses and little Miss is so precious! Sweet photos of happy times! And thanks for the encouragement on my journal! Enjoy your day! Hugs! And Little Miss is adorable! Have a great week! Cursed black spot! My roses have it too. Little Miss is brave like her Grandma. I must have missed posting last night. Thanks for coming by my garden. Your roses are truly lovely. It is so nice that you are having them bloom already, when mine are na'er to be seen. Your Little Miss is a cutie. Lovely roses, Lorrie . . . mine has one bloom opened and a dozen more coming. It is in a big planter and doesn't seem to get the black spots that the other ones in the yard do. Little Miss is just so cute, love that she loves to explore the seaside. Wonderful rose-mosaic. And lovely photos too, espec of the little one. Your mosaic is so pretty and Little Miss is adorable! I bet she is a lot of fun to be with. I love your beautiful roses. Little Miss is one cutie also. So fun to see what fascinates them. LOrrie love your pics today! Roses are my fav however in my woodlands hard to grow..but I ave a plan! I love the activity near lake or ocean. Have a great week! Nice meeting you! I'm pleased (and relieved) to hear that roses are just beginning to flower back home. I've been feeling sad/anxious that I might miss them, having had roses blooming thickly all around here for weeks. Some of my favourites at home (Constance Spry) are once-bloomers, and I'd hate to have to wait 'til next spring to see them again. Our little girl is similarly fearless on the beach, frustrated with anyone wanting to hold onto her even if she's just been brought down by a waist-high wave. Yours looks so sweet. Roses, the beach a lovely little G D what a wonderful day you must have had. Lovely photos as always, Lorrie! Your Little miss is so sweet. I can just imagine the fun she'll have - perhaps at Willows Beach where the water always seemed warmer when we were kids. Happy times, happy family, happy post! I do know what you mean about black spot and roses. And aphids, mildew anaren't the second rose bloom in autumn a whole lot easier to enjoy? Roses are my favorite flowers and I've noticed that they bloomed early here as well! I hope you can save your from the black spot. Little Miss is adorable, and I'm sure she found lots to see and do on the shore. Unfortunately, mine is suffered from the same black head infection. From the flowers to the Gulls, very nice series! Very pretty roses and cute kid.